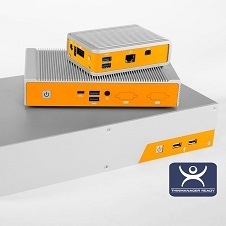 SOUTH BURLINGTON, VT - APRIL 9, 2019 - Global industrial and IoT computer hardware manufacturer Logic Supply (www.logicsupply.com) , in partnership with centralized computing software leader ThinManager®, have updated their line of thin client computer hardware to include the latest generation of Intel® processors. The new Apollo Lake and Coffee Lake powered systems are the first thin clients available to combine ThinManager's proven centralized computing architecture with the speed and capabilities of Intel's newest CPU architecture. "The ThinManager software platform and Logic Supply's industrial hardware combined, along with Intel's drive to provide industry-leading processing performance, creates a convenient and highly-capable turnkey solution for users who need a more dependable thin client," said Murat Erdogan, VP of Products at Logic Supply. "Over the years, we've used feedback from ThinManager users to optimize our hardware offering, accounting for the specific needs of centralized industrial computing. The wide range of configuration options we build into our hardware give ThinManager users a reliable, easy to install, long lifecycle solution that can be perfectly tailored to meet the unique demands of their installation." These new systems allow Logic Supply thin client users to leverage the improved performance and multi-tasking capabilities provided by Intel's latest Apollo Lake and Coffee Lake CPUs while standardizing on a hardware platform with a fresh lifecycle. The Logic Supply TM110 and TM250 are powered by Intel's Apollo Lake CPUs, while the TM610 offers a range of Coffee Lake processing options. Each system in Logic Supply's ThinManager-ready line has undergone extensive testing by the team at ThinManager to ensure proper functionality, and comes pre-loaded with the necessary BIOS image to allow download of the appropriate firmware directly from ThinManager. This enables users to get up and running in minutes. "As we see industrial thin client adoption continue to grow worldwide, we are very pleased to have a partner like Logic Supply who consistently provides state-of-the-art hardware and excellent customer service for industrial professionals seeking to deploy a modern thin client platform," said Doug Coulter, Product Manager for ThinManager, a Rockwell Automation Technology. Logic Supply's ThinManager-ready hardware features the company's proprietary Hardshell™ Technology - a combination of ingress protection, solid state design, rigorous thermal testing and ruggedization that eliminates the most common failure points in computer hardware. The company's thin client hardware is currently being utilized by global leaders in manufacturing, energy, smart agriculture and logistics, among many others. The combination of Logic Supply hardware and the ThinManager software package allows for reliable centralized management of an entire network of user terminals. Each thin client system in the network can be updated, monitored and maintained from the network server, eliminating the time and costs associated with individual maintenance and updating of each user terminal, improving the consistency and timeliness of security updates, increasing operational efficiencies and lowering overall IT expenditure. Logic Supply's ThinManager-ready systems are highly-configurable with a range of I/O options, including multiple LAN for data handling flexibility or network redundancy, and COM for connectivity to legacy equipment. Logic Supply has developed their thin client line to provide a flexible platform for development, and enable installation anywhere a client terminal is needed. Select systems are rated for operation in extreme temperatures, ranging from -20°C to 70°C, and provide a 9~48 V DC input for applications with inconsistent power delivery. Logic Supply also offers actively cooled ThinManager-ready systems designed for control rooms, office use, or other controlled environments. Finally, they offer a range of ThinManager-ready touch screen panel PCs for direct operator interface without the need for a separate display. Logic Supply ThinManager-ready hardware is available online by visiting www.logicsupply.com/technology/thinmanager/. For assistance with configuration options, or to discuss project requirements, contact a Logic Supply Solution Specialist at info@logicsupply.com or call +1 802 861 1590 in the US or +31 88 5200 700 in the EU. About Logic Supply: A global industrial PC company focused on hardware for the IoT edge, Logic Supply designs highly-configurable computers engineered for reliability. Their systems operate in the harshest environments and power innovation in the evolving Internet of Things. Fueled by a unique direct-to-customer business model that combines vertical integration, modular product design and a powerful online platform, Logic Supply offers computers “designed to last, built to order, and delivered in days.” Founded in 2003, the company has served over 70,000 customers. Logic Supply has offices in North America, Europe, and Taiwan. Learn more about why innovators choose to "Build It With Logic" at www.logicsupply.com or on Twitter @LogicSupply.